Do you have a Little Free Library in your neighborhood? It’s not what you might be thinking. A Little Free Library isn’t a big building full of books. It is, seriously, a really, really small library that is usually housed in a wooden box that looks like a tiny schoolhouse. 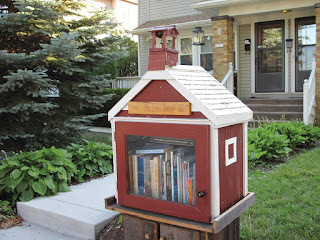 These little libraries are located in the fronts of publicly accessable locations like schools, shops, healthcare facilities, etc., but I most often see Little Free Libraries in the front yards of people’s private homes, facing the street, full of books for anyone to borrow. I always marvel at the commitment of those who decide to make the little library a prominent feature of their home. The Little Free Library movement started in 2009 when a gentleman from Wisconsin built one as a tribute to his mother, a former school teacher who loved reading. He filled it with books and put it on a post in his front yard. This developed into a mission to promote literacy and the love of reading by building free book exchanges worldwide. Anyone who has the desire can install the library; you can build one yourself or buy one. I see on the interactive map that there are a few countries in Europe that have two or three little libraries. Italy has 23! Do you have one in your part of the world?